I have written in this blog about the importance of speaking to the audience as a performer. Now, audience members, it’s your turn. When you attend a concert, do you experience a huge divide between the house and the stage? The pit adds distance. Does the performer seem to be inaccessible? Is there an aura on stage? Performers can sometimes seem larger than life. When I was in college, Leontyne Price, Zara Nelsova, and the Bach Aria Group all seemed this way. If the performer doesn’t say a word, s/he may seem inapproachable, even inhuman. What happens in a concert can seem otherworldly. I have experienced this many times. Stage lights, performers’ attire, perhaps my age at the time ~ many things can contribute. In my opinion, what happens during and after concerts needs to be more of a 2-way-street, an interaction. So, following a performance, what do you do? Go backstage? Head for dinner? Think that maybe you’d like to meet a performer or two, but don’t quite follow through? Why? 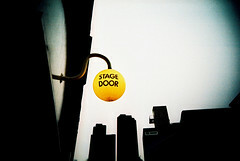 Do you have misgivings about going backstage? You, as a member of the audience, can participate. Having expended all that effort, even though that is what performers live for, they would love to meet you! In the years before Richard Stoltzman received the Avery Fisher Prize, he played at Marlboro on several occasions. I went backstage to meet him 2 or 3 times, having played for 2 of his Cal Arts students at Aspen a few summers before. Peter Serkin was at the door, hugging everyone. Fred Sherry was equally as friendly. Stoltzman was over in the far corner, looking down, putting his clarinet back in the case. He was genuinely grateful to have someone approach him. Joel Krosnick, cellist in the Juilliard Quartet, once told me about a solo concert tour he did in Germany. He spoke no German, and the stage hands didn’t speak English. No one came backstage. So Joel started making up things in English, talking to the stage hands just for fun. An audience member or two backstage would have been welcomed. He instructed me to always go backstage. William Warfield was the stunning bass soloist for a “Messiah” I heard in Illinois when I was in seventh grade. Much later, he presented a solo recital at my school. I decided to go to the reception to let him know how much he “got” me in the 7th grade. Warfield was not only friendly, he was very funny. And he remembered the name of his hotel in Illinois and the room number! Wondering what to say? You don’t have to be profound. You could mention a favorite piece from the performance, or one you hadn’t heard before. You could thank the performer for coming, and say you hope they’ll come again. Inquire about their instrument. Ask where they’re playing next. You are the reason we are here. Please come backstage! Given that the future of music, and all the arts, is in the hands of our children, what can we do to enhance their exposure? Very often, the adults who make kids’ schedules send them to events, lessons, classes, etc. That’s commendable. But is it enough? I think frequent parental involvement is crucial. When playing “Pirates of Penzance” performances in an elementary school, I had the opportunity to observe a class of young students (about age 4) discussing what they had seen and heard. The kids were so excited, they couldn’t wait to talk about it. I would love to see more parents going to all things musical with their children and talking about it afterwards. Ask your child what they liked best, what they noticed, why they liked it (or didn’t! ), what they would do differently, etc. Involve them in the discussion, and listen to what they have to say. Their interest will grow every time. And what they say will definitely surprise you. You too will gain new perspective. While living in NY, one of my students, an 8-yr.-old, attended a “Young People’s Concert” at Lincoln Center. When she mentioned it during her lesson, I started asking questions. So… she had actually listened and made an accurate assessment! If your children are taking lessons, that’s wonderful! Please encourage them and don’t be critical. You can help them make practicing fun. Are your preschoolers involved in the arts? You don’t need to buy a set of rhythm instruments. Pots and pans and a wooden spoon are fun! If you don’t want to see your Cuisinart equipment being banged on, then go to a tag sale. You and your child can make shakers from a container and some pebbles. Much more fun than buying them at the store, especially if you paint them. Glass bottles, when filled with different amounts of water, produce different pitches when tapped with a fork. With a little experimentation, you could make a scale, then play “Mary Had a Little Lamb,” “Frere Jacques,” “Row, Row, Row Your Boat,” “Twinkle, Twinkle,” etc. Barney’s song, too, if you can stand it…. Babies need to be sung to! A performance-level voice is not required. Please don’t wait until your child is “older.” Babies will happily move to a CD, clap, mimic songs they hear, and make up their own. If you wait until your baby is two, your baby will be two years behind. When your baby or toddler goes to the piano, let them play! Rather than discouraging them, try showing them how to produce a pleasant sound. If you play yourself, have your child play one or two notes while you play a melody. Studies have shown that involvement with music creates new pathways in the brain. This results in an enhanced ability to make relationships and solve complex problems in creative ways. I’m trying to think of a down side right now, and nothing comes to mind. The benefits of being involved in the arts last for a lifetime and have an influence on the next generation. The more an individual knows about music, art, dance, theater, etc., the more that person will understand and take away from a performance. A career in the arts may or may not happen ~ it takes years and years of training, a great deal of determination, an environment that is friendly to the arts, and, of course, luck. But aspiring to a career is, hopefully, not the only reason your child is taking lessons. (You may be hoping for that career, but your child wants to be a kid.) Producing concert performers is certainly not the only reason I teach lessons! Future audiences depend upon our children. In light of all the music programs that have been discontinued, there is precious little music education going on. More and more of the responsibility lies with us, the adults. Support the Arts! Actions YOU Can Take RIGHT NOW! The Honolulu Symphony has filed for bankruptcy. Two concert series I have played in have cut back from 7 to 6 and from 4 to 2 concerts this season, respectively. Numerous schools have no arts programs at all. And on and on. How can we as individuals act to help keep the arts vibrant? There are many things each of us can do, even without contributing funds. the idea. Someone from the Revels came. (Everyone there was a professional singer, so it struck me that everything was authentic, with a lifetime of experience behind it, not learned in school.) This was all very informal ~ they just went around the room, remaining seated. and the stage manager. You’ll hear wonderful stories! Even small contributions do matter! The arts, now more than ever, need your help. Please participate! 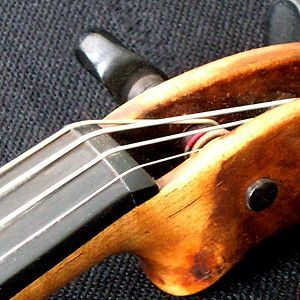 Since ergonomics has been an ongoing interest as well as a recurring topic in my blog, I asked Don Ehrlich to write about his ergonomic viola. I remember reading The New York Times article about him with great interest. Thanks so much, Don! Your first-person account adds so much to people’s knowledge on this subject. I am a viola player. Until I retired in December 2006, I was the Assistant Principal Viola with the San Francisco Symphony. I suspect that I have congenital weakness in both thumbs, which is probably genetic. My sister, my son and I all have thumbs where we hyperextend. My sister recently had surgery on her thumbs to repair some of the damage that she has incurred. She is very happy with the outcome. I had my first playing injury in early 1988; this was, predictably, in my left thumb, the joint closest to the wrist. The doctor called it a subluxtion, if I remember correctly. I was hooked up with a wonderful physical therapist who got me back playing in a month or so. Her understanding of how the hand should work, as opposed to how my hand did work, and the exercises she gave me all helped. It is now 20 years later, and I’m still doing those exercises. I do believe in physical therapists. They know different things than the doctors do, in the realm of mechanics. Over the next six or seven years, I had a series of injuries to my left side. Nothing major, but annoying. One I remember was to my left shoulder. In all instances, a little physical therapy cleared up the problem. Then, in 1996, I got some tendinitis in my left elbow, in two different tendons. It was only a little painful, but it did limit my ability to play long and hard (which is the definition of an orchestral job). In looking forward, I had the feeling that this injury, left untreated, could turn me into what some might perceive as the prototypical tenured long-term orchestra player: cynical, hurt, hating music, expending as little energy as possible, just putting in my time until I could retire. I did not want that to be my life. I also began to feel as though my instrument was at least partly to blame. It was a 17 inch viola and reasonably heavy. When I was younger, I could easily handle that viola, and I loved that instrument. But maybe it was time to find something smaller. I began the search, a frustrating and expensive experience. I found a couple older Italian instruments that were 16 inches and had beautiful but small sounds. I felt that in my orchestral world these instruments would not be of a net benefit to me because I’d end up working so hard to get a large sound. Also a negative for these instruments was the price, around $150,000, the kind of money I just don’t have. Just then I picked up a copy of Strings Magazine, the July/August, 1996, issue. There was an article by Darol Anger about some different designs of violin family instruments. Mostly, the unusual designs had to do with instruments for popular music. But the last one Anger wrote about seemed to be designed for my kind of problem. It was the Pellegrina model viola designed and built by David Rivinus. Thus began a long and interesting journey. I emailed Rivinus and he sent me an instrument. I introduced the viola to the Symphony’s personnel manager before bringing it on stage. His comment: “If it helps, I’m all for it.” He then introduced the viola to the rest of the orchestra. Everyone had a smart-assed comment to make. Isaac Stern told me I had left it out in the sun too long. Before I got the Pell, if I would have a week or two vacation, when I’d go back to work my elbow would hurt as much after a rehearsal as it had before the vacation. After I got the Pell, my elbow would feel better after a double rehearsal than before. So I knew I was on to something that would be of benefit to me. In August 1997, there appeared in the New York Times an article about my Pellegrina and me. Wow. Can that experience ever change your life! If it did nothing else, it showed the music world that change is possible, that you don’t have to hurt when you play. If I understand properly, there are three other experiments in ergonomic instruments that have been undertaken; none has caught on. One is the flute with the bent head joint, meaning that the flutist’s head can be upright and the arms at a comfortable level at the same time. The complaint is that it changes the tone. But frankly, I suspect if there were an accomplished flutist who would make it his/her business to work with a flute maker it could yet be refined. Our business is so conservative; people are reluctant to make changes. There is also a bass clarinet with a redesigned head joint (or whatever it’s called) to take the pressure off the player’s neck. The third is a piano keyboard that curves around at the extremities and has narrower keys. I understand that the designers of the keyboard tried to design it so a pianist could travel with the keyboard, take out the keyboard of the piano he or she would play on, and insert the new one. David Rivinus’ Pellegrina model viola has cleared up the playing problems on my left side. More recently, I have had a problem with my right thumb. Several years ago, while we were doing Beethoven’s Eroica for the Symphony’s Keeping Score project, something popped in my right thumb. I think this again is basically because of the congenital weakness in my thumb, along with an accumulation of years of scrubbing (read: tremolo), which happens a lot in the music of Beethoven, Bruckner and others. Again, physical therapy got me to where I could play without pain. I need to use tape and a flexible splint, as a kind of exoskeleton that I put on and take off, for support. And I retired from the Symphony so that I could pursue other playing opportunities. I played a full recital 1½ weeks ago; I feel as though I’m still making progress in my ability to perform at a high level. However, both of my thumbs are acting up just now. I have an appointment with a hand specialist in a couple weeks; I’ll probably be following other leads as well in the next months. I’ll just have to wait and see what the future will bring here.